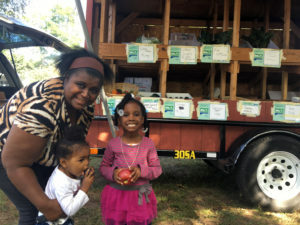 This week, New Haven’s mobile farm market makes its last round of stops for the growing season. Fall is here, and with it comes one final reconfiguration of the mobile market produce ensemble. Bowing out are peaches, cucumbers, and zucchini, making way for the new cast of pears, apples, radishes, and potatoes. Monica Edgerton, who along with with Jess Zielinski manages the mobile market, shares produce with eager customers. 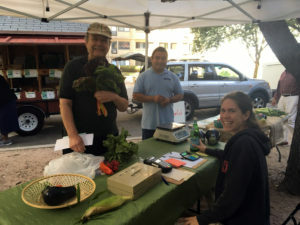 Since mid-June, the mobile market has brought fresh local fruits and vegetables to partner communities throughout New Haven, such as Bella Vista and Bassett Park. You can see a complete list of stops on CitySeed’s web site. You may have noticed this trailered vehicle in the Common Ground parking lot, or out and about in tow behind Common Ground’s trusty Honda Pilot. This deep red market vehicle looks like a little chicken coop on wheels, only its sides open up to reveal two rows of shelves on each side, displaying produce grown right here in southern Connecticut. 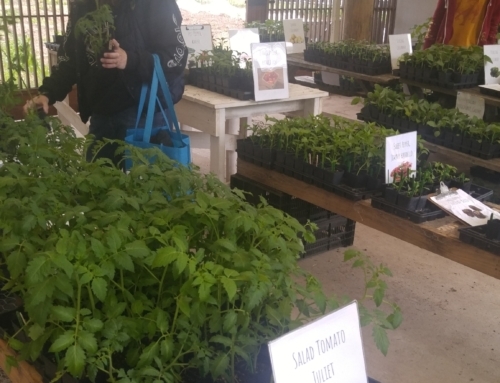 Tomatoes and eggplant are among the variety of veggies and fruits sold at the mobile market this season. 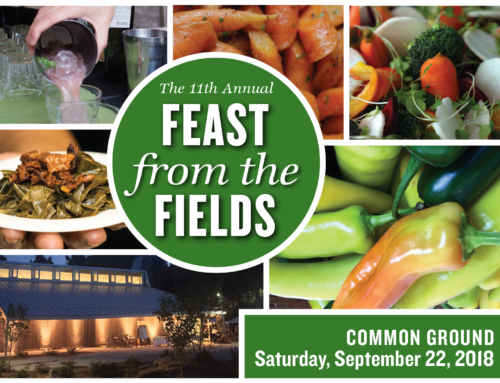 All produce is sourced from Common Ground and other local farms. The mobile market operates as a collaborative effort between CitySeed, Common Ground, and New Haven communities. 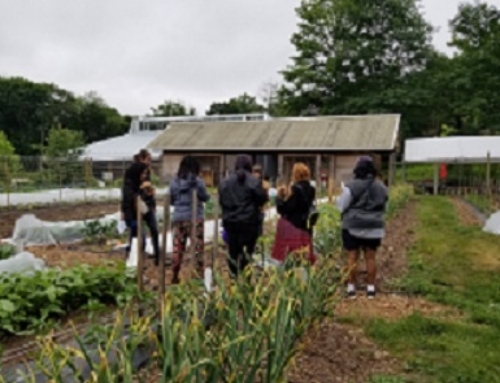 This collaboration helps improve access to healthy, locally grown foods in communities with limited means to attend other farmers markets or patronize a full service grocery store. The mobile market takes cash and credit cards, but also accepts many forms of food assistance like SNAP (Supplemental Nutrition Assistance Program). 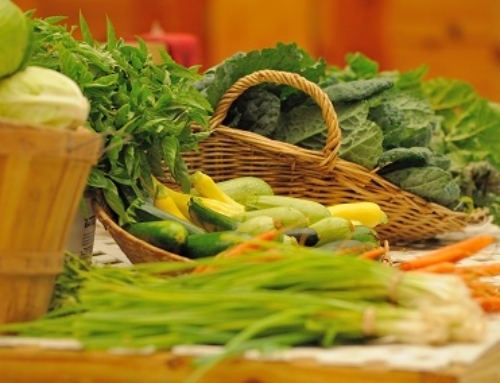 The mobile market doubles the value of these programs: for example, a patron is able to get $20 worth of fresh, local produce for just $10 in SNAP benefits. While we’re still doing the final math for this season, last year nearly 75% of purchases were made with food assistance benefits. This summer — the fourth in which the mobile market has operated — fruits remained an all time favorite. Strawberries and raspberries gave way to blueberries, which then gave way to plums and peaches. Corn and tomatoes reign supreme for the veggies, while collards and kale vie equally as favored greens. Least popular, but with a cult following (as well as drawing in the curious and adventurous with its rainbow allure): Swiss chard. 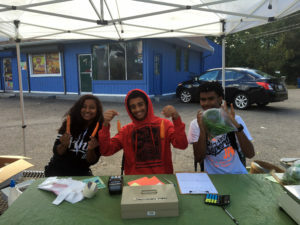 Jenisha, Tyrese, and Kentea — Common Ground Green Jobs Corps members — work at the Mobile Market in Scantlebury Park. The mobile market is operated by a few dedicated adult staff working alongside enterprising Green Jobs Corps students from Common Ground High School. After a season of witnessing the responses that mobile market patrons share while making their selections among the offerings, these market staff now recognize each fruit and vegetable as seeming to have taken on a bit more personality. There are the underdogs, the workhorses, the overly sensitive, the rock stars, and so on. And as can be the case for person-to-person interactions, one of the most gratifying moments is when someone sets aside a preconceived notion to give a little-known or presumed dislikable character a chance at redemption. Better yet? Returning patrons, pleased with their gambles, share with us how they prepared the produce as a new element in their cooking, and how great it turned out! 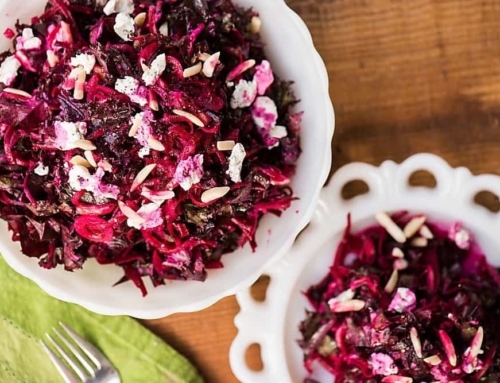 As they make their selections from the shelves for this week’s meals, we notice that they might opt for double the amount of the newfound favorite fruit or veggie. This time, they’re getting enough to split with a friend. Over a full season, these loyal patrons have become our friends and supporters, as well as our customers. Monica, who along with me managed the mobile market, describes one day when she was operating the market alone in the pouring rain. As she was getting the market set up at the Connecticut Mental Health Center, one of these regular customers stepped up silently to lend a hand, holding up the sides of the market to protect Monica from the rain. Thanks for being there right along side us, New Haven, showing how much you care, and taking the time to share. Your involvement meant a great season this year, and an even better one next year!